Create a SUPER bulletin board! 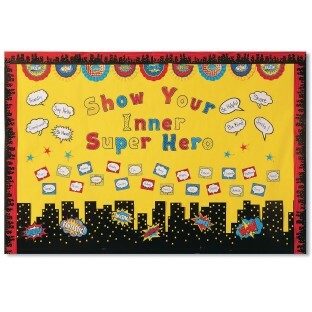 Encourage your group to show their inner super hero qualities! Feature them, their activities, and accomplishments with this star-studded set! Encourage your group to show their inner super hero qualities. Feature them, their activities, and accomplishments with this star-studded set! Black Polka Dots on White Scalloped Border Trim. Great for highlighting key characteristics, creating job charts, schedules, center groups, and word walls. Includes activity guide with suggested ideas.